One of the greatest civilizations of the past was undoubtedly the Egyptian one. To know who is Nefertiti we have to go back to 1330 BC. Ancient Egyptians brought forth many advancements including mathematics, engineering or medicine, all important advancements for the future of humanity. It has an impressive legacy that left many unresolved puzzles, such as: how did they build the pyramids of Egypt?, the Sphinx or the hieroglyphics . During its 3,000 years of history, Egypt was ruled by different kings who accumulated all power and were considered divine by their people: the pharaohs. Nefertiti married Pharaoh Amenhotep IV known as Akhenaten , but this amazing woman exercised a great influence on the Pharaoh. Akhenaten led the empire from 1353 to 1336 before Christ and like the other kings; He had several wives at the same time. Of all his wives, only one was the most charismatic, only she would be considered the official wife; her name is Nefertiti which means “a beautiful woman has come”. Unlike other queens of Egypt, Nefertiti actively participated in the government of her people and there is evidence that she practiced religious services; activity that was reserved only for men. This couple had 6 daughters, Meritatón , born c. 1348 a. C., Meketatón , born c. 1347 a. C., Anjesenpaatón , born c. 1346 a. C., Neferneferuatón-Tasherit , born c. 1344 a. C., Neferneferura , born c. 1341 a. C., Setepenra , born c. 1339 a. C.
If something differentiated her from the other queens it was her beauty, she was said to be proud of her long swan’s neck. It is said that her name comes from a type of golden pearl called “Nefer”, a pearl that undoubtedly often worn by the people. It is unknown today who were her parents, but what we do know is that she was the cousin of Akhenaten. At that time, inbreeding was considered normal. There is a conflict between the evidence of historical records, the name of Nefertiti disappears in the 12th year of Akhenaten; it is as if she had died, but the great mystery of all this is that if she died, why does it not appear in any records? Someone as influential as her disappears from the face of the earth as if by magic. What really happened from year 12 of Akhenaten? About that time the queen would be about 30 years old but a statue of the Berlin museum represents an aged Nefertiti. If this is true, what happened to it? 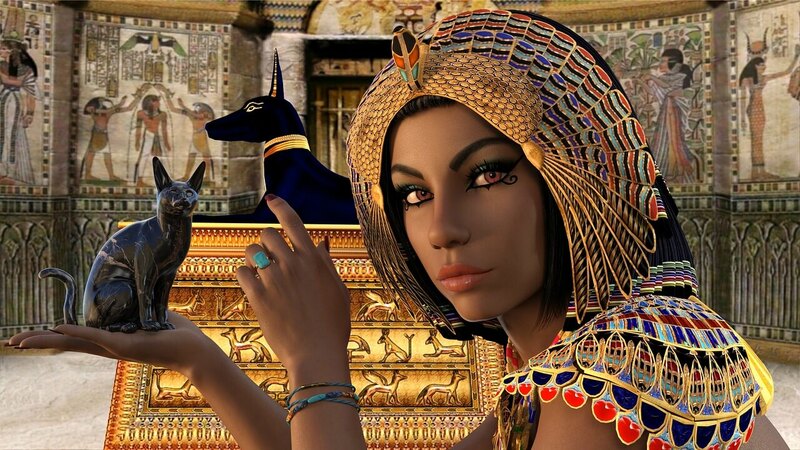 The name Nefertiti disappears while Akenatón still lives but a new name appears, Neferneferuatón. This change of name was to take power with Akhenaten, although his reign would only last 5 years longer since Akhenaten would die for suspicious circumstances. Valley of the Kings“. This tomb is located on the west bank of the Nile, at the height of the current city of Luxor. They discovered several bodies in Kv21 and observed that two mummies could have been queens . The most important fact that surrounds both mummies is the position of their arms: the left arm bent over the chest, and the right along the side, this indicates that both women were queens. DNA analysis performed in 2010 on the mummies of Tutankhamun and some of his alleged family members; they allowed to discover that one of these two mummies was the mother of the two daughters of the young king; born dead and buried in tiny sarcophagi in the grave of his father. Therefore, it is Queen Ankhesenamón , this whole study was based on the findings of Egyptologist Zahi Hawass who started in January 2016 new DNA analysis to prove it. It is very likely that the other mummy could be Nefertiti, but it is still not known for sure. The adoration that the people felt for her was very great and was sometimes represented as a goddess. She occupied a prominent place both in the heart of Akhenaten and in the village, which perhaps she achieved thanks to her extraordinary beauty. Nefertiti became famous again when her bust was discovered in the ruins of an artist’s workshop in Amarna; in 1912, a piece now preserved in the Altes Museum in Berlin . Thanks to “Rosetta Stone” all this has been deciphered; not from the stone itself, but from the language of the hieroglyphs. We are only one step away from discovering her whereabouts and in this way, know a little more about this enigmatic queen.